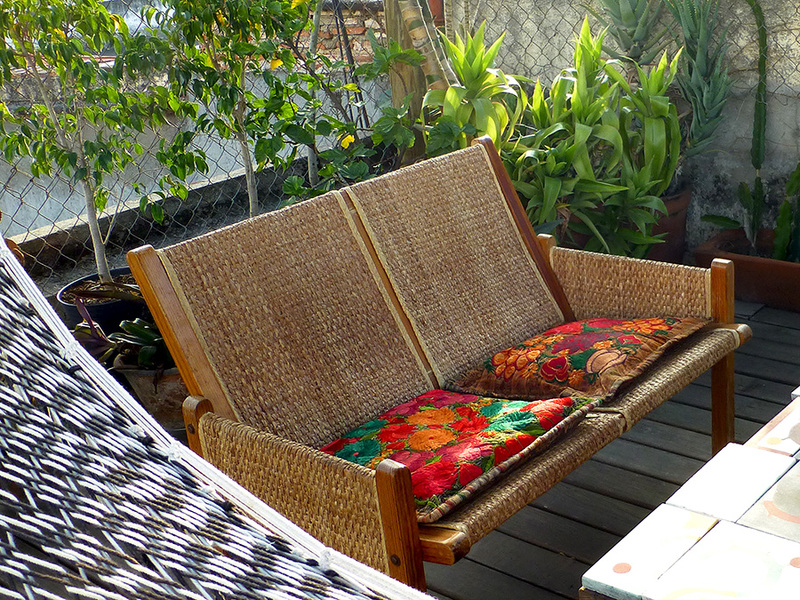 Once upon a time, I went to Linda Hanna’s house in San Andrés Huayapam — the B&B Casa Linda. In addition to running a B&B, she leads artisan tours, is a major collector of textiles, art, crafts, and you name it, AND holds occasional yard sales. I always try to attend the latter and always buy a thing or two or three or four. 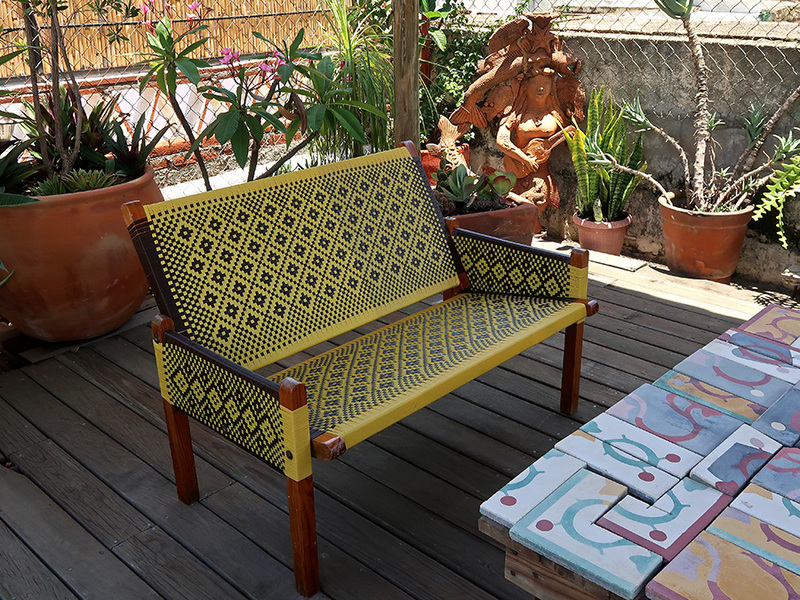 Thus, 2-1/2 years ago, this loveseat found it’s way onto the terrace of Casita Colibrí. Linda wasn’t sure where or when she originally purchased it and it had long been relegated to a bed for a member of her animal menagerie, as the palm had completely disintegrated on one side, leaving only the jute webbing to prevent one’s bottom from landing on the ground. However, it had “good bones” and I had fallen in love with it. I figured that with a couple of decorative pillows to hide the hole, it would look great and be relatively functional. They did and it was. Over the course of the past couple of years, the elements have caused more wear and tear to the palm and the wooden frame needed work. Into the story comes Sebastián, of Talavera transformation, part 4 fame. As if it wasn’t enough to be a carpenter, stonemason, electrician, plumber, and glazier, he and his wife Elizabeth had taken classes in weaving with plastic and started a business — primarily making baskets/purses. A couple of months ago, he stopped by to show me their latest projects and I had an inspiration. Could they refurbish my loveseat? His eyes lit up, said yes, we talked colors and designs, and a few weeks later he hauled it away. On Wednesday, it came back home. I suspect you are asking, why plastic when the palm looked so beautiful? Two reasons. Firstly, it was a spur of the moment decision, but I knew Sebastián, trusted the work he does, and loved the creative possibilities he showed me. 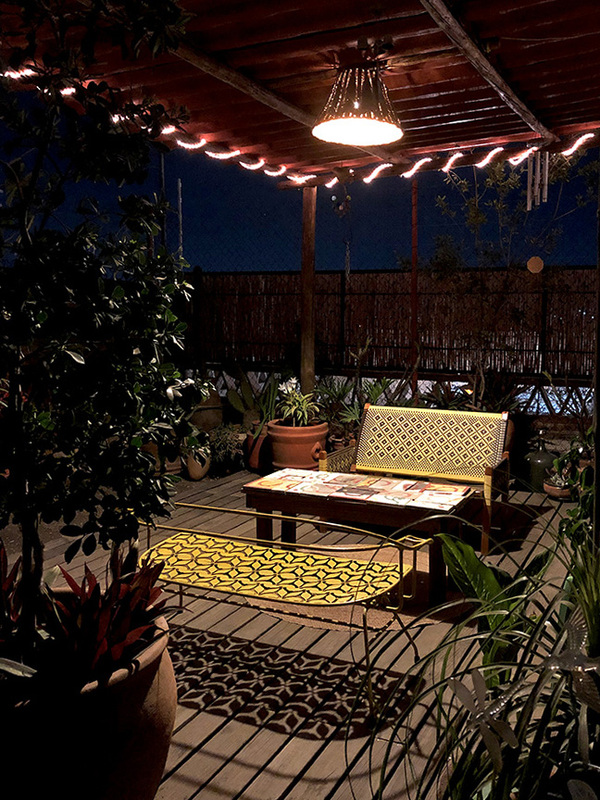 Secondly, I’d bought the loveseat to live outside on the terrace (albeit, under the gazebo) and in the back of my mind, as the palm seat, back, and arms continued to deteriorate, I’d wondered if there might be something more long lasting that could be used. Thus, plastic. However, it’s not just any plastic, Sebastián and Elizabeth’s business uses recycled plastic. By the way, they also refinished the wood, using a marine varnish to help contribute to its longevity. I think, in its new incarnation, my loveseat still looks right at home and what is old is new again!